We are offering sole use of this small clinic for aesthetics practitioners. Based at Containerville in East London, the clinic is one of 70 small business spaces operating from this unique working environment. An Award Winning Aesthetics Business for Sale in South Devon. Leasehold with prominent double shop-fronted High Street Location. 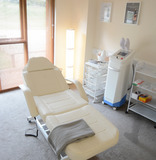 Turnover £370,000 per annum, 2 Treatment Rooms & space for expansion. Principal willing to Mentor income Buyer.